What tools can be used to enrich the grade-level curriculum and challenge our students? A menu is a content-focused set of options from which students choose activities and tasks on which to work. Students can receive a menu for a specific time-period, such as a week, for a unit of study, or for a grading cycle. Menus provide instant opportunities for differentiation because students choose which activities they would like to complete based on their own interests and ability levels. This free resource pack includes one choice board menu related to whole number operations. To complete this board, students will need to complete all of the activities in a row, column, diagonal, or the four corners. The pack also includes additional materials needed to complete the board, including a Cover Up game, a tiling task (with reproducible tiles), detailed directions and materials for product creation, recording sheets, project templates, and a "Free Choice” proposal form. Click here or on the image above to grab your freebie from my Teachers Pay Teachers Store. 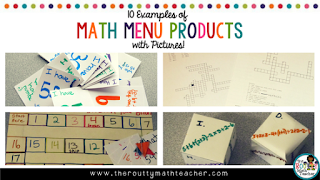 Head on over to The Routty Math Teacher website and read, "10 Examples of Math Menu Products with Pictures" where I share examples of my, and my students', favorite math menu products. Read the post here or by clicking on the image below.